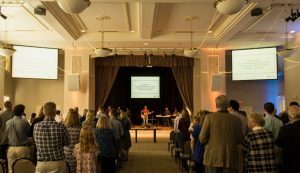 A portable church that goes into a large banquet hall and wedding venue on Sundays, Cornerstone Church recently upgraded to a Martin Audio Wavefront Precision Mini line array system. Compact and efficient, Wavefront Precision introduces a scalable approach to resolution and control of coverage that functions in tandem with external, dedicated multi-channel amplifiers in a uniquely flexible, upgradeable, and price-conscious system. The more cabinets with dedicated amplifier channels, the higher the resolution and scale of coverage control achievable. According to system designer and integrator David Price, “the hall is in a historic building and has several acoustic challenges which explains why we chose the WPM system. The room has a mammoth 35ft. tall x 30 ft. wide curved center channel area where tons of acoustic energy can get trapped. WPM gives us control over directivity of the system so we can avoid that area and put the energy on the audience where it needs to be. “There are marble columns spread throughout and the ceiling is all plaster with no acoustical paneling and all these cavities. 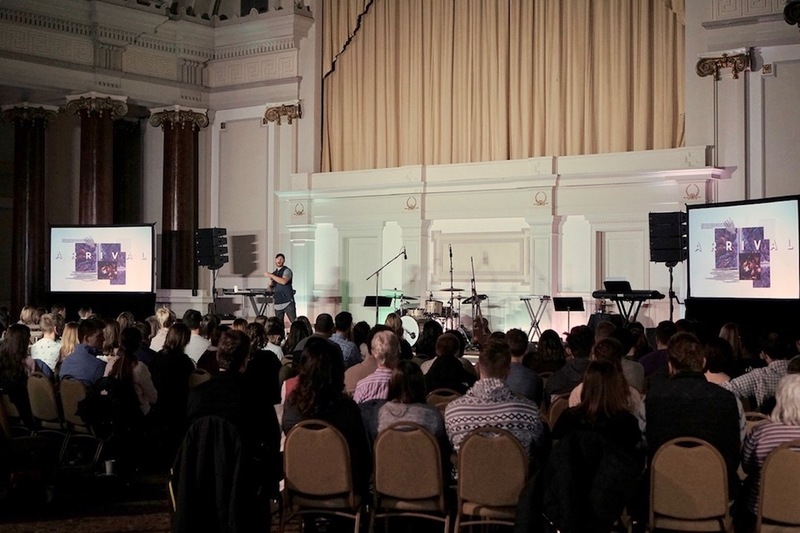 They also needed the system to be loud for the contemporary worship service without killing people in the first couple of rows which happened with the previous PA because they had to push it so hard. The actual setup includes four WPM enclosures a side, pole mounted on top of two SX118 subs on stage, all driven by a single iKON iK81 amplifier with two channels per box resolution. Four channels out of the 81 drive the mains and the remaining four channels drive the subs. Pastor Jonathan Strohbusch also recalls the previous system “was being pushed beyond its limits. Even though we were only seating 250 people in that big a room, we couldn’t get sound to the back row without deafening levels in the front. 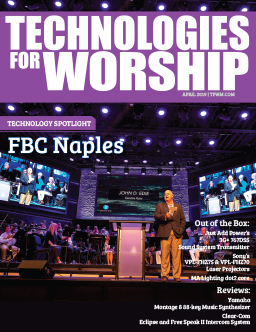 “So, when we looked at options for creating even coverage and maintaining portability, the Martin Audio Wavefront Precision system made total sense for a church like ours where the system has to be carried up a flight of stairs. “It’s lightweight and compact, which simplified setup and tear down and relatively straightforward for our volunteers to operate. That, plus the price point for what is exceptional sound quality made it a no-brainer, especially once we heard the system integrated for our space. 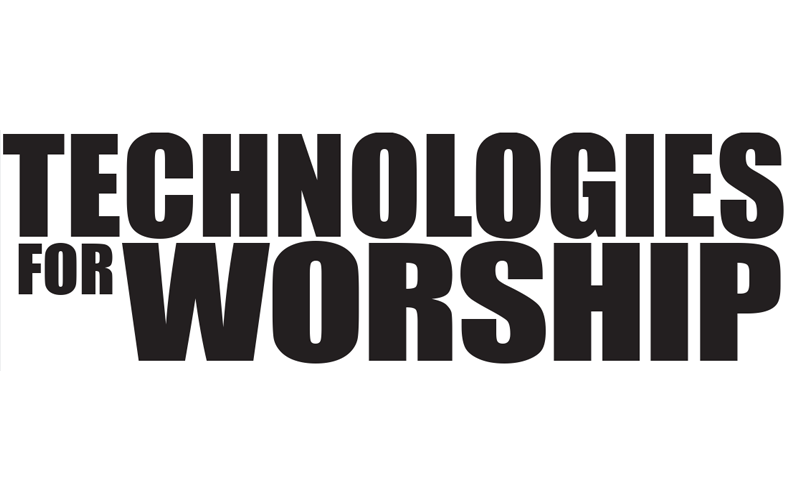 “We have a contemporary worship service with electric bands playing very loud and it’s crazy how quiet it is onstage. In terms of my sermons, it sounds like I’m having a conversation with my church. And now the music reproduction lets us hear the full spectrum of the band. 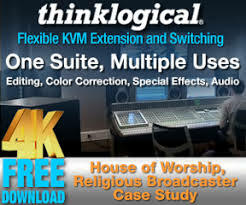 You can focus on any part of the mix with no problem because of the spacious sound quality. It’s real pleasing and smooth to hear, even at the highest decibel levels.